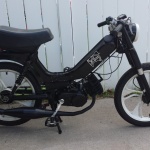 So I’m having a little bit of trouble with the Tomos Targa (I think I’m going to name it ‘The Zebra’). Basically I accelerate pretty steady up until I hit 37 mph, then it just stops and cuts out. It feels like I flipped the kill switch for a second then turned it back on. On my way there it doesn’t feel like the engine is showing any signs of peaking out and it doesn’t behave as if it’s four stroking. I’ve re-jetted the main jet richer without any noticeable difference, and I’ve disconnected the entire lighting circuit just to take that out of the equation. No Change. The first half of the throttle seemed like it might be running lean so I richened up the needle setting a slot and adjusted the idle screw. Nope nothing still cutting out when I rev it on the center stand. To mean this all points to the CDI being the culprit so last night I decided to swap mine out with a spare Treats Puch CDI setup I had, but as luck would have it the CDI box appear to be burnt out. I can get like one spark out of it. It’s kinda weird. So I’ve got a new box on the way unfortunately I’ll be missing out on tonight’s moped ride, which is kinda sucky. I’ll make another video of the results once it shows up.